There's 'beat' as in the Beat literary movement that produced beatniks, and poetry read over (usually) jazz music. And there's 'beat' as in the European '60s rock'n'roll-inspired pop. The kooky, sometimes hilarious Dutch band The Zipps combine both: yes, a Beat Beat group. 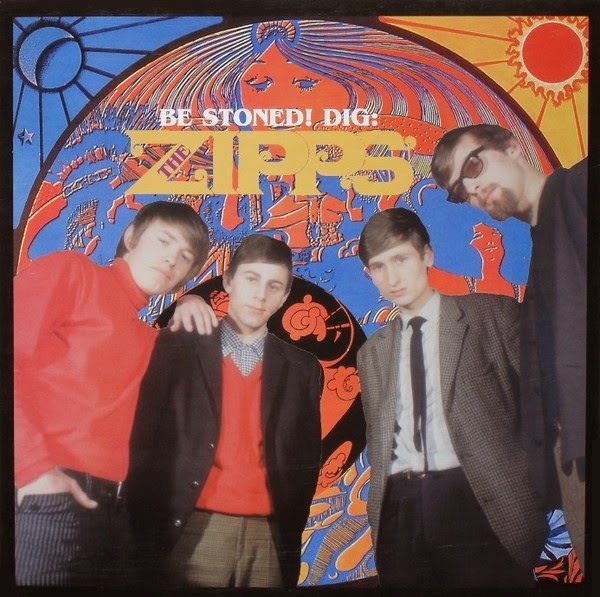 Their music's fine in a basic mid-'60s garage kinda way (some tunes are quite catchy), but the real distinguishing characteristic of The Zipps is singer/guitarist Philip Elzerman's English-as-a-second-language vocals, which are either nonsensical, or obscured by his thick accent. Or both. In the Ramones-y titled, Byrds-y sounding "Kicks and Chicks" Elzerman claims that he "read all the books of Jack Kerouac," but he pronounces that Beat icon's name as "Ker-acky." Two lengthy tracks called "Beat and Poetry" are live all-Dutch language spoken word over peppy rock music, not jazz. An odd combination. Tho in the hysterical "Hipsterism," one of the greatest, funniest '60s nuggets I've heard lately, Elzerman says "I always like to listen to good jazz/You're a square! And you don't like it, I guess!" Followed by a solo on that most rock'n'roll of instruments, the flute. Having said that, the groovy a-go-go instrumental version of "Lotus Love" is one of my faves off this career-spanning collection. Wish I could hear all of "LSD 25" minus the interview on top of it, it's a great Seeds-y proto-punk stomper. Thanks again to our psychedelic nugget farmer, Count Otto Black! 9 – When You Tell It, Tell It Well..! far out, man. this is a heavy trip....thanks or layin' it on me.